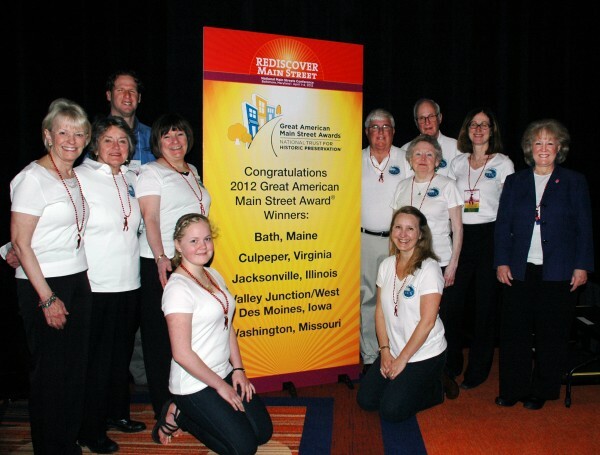 Residents and officials from the City of Bath pose for a photo on Monday, April 2, 2012, after winning the National Trust for Historic Preservation's 2012 Great American Main Street award. BATH, Maine — The city of Bath added to its laurels as one of the nation’s premier destinations Monday when it was named a 2012 Great American Main Street Award winner by the National Trust for Historic Preservation. Every year, the National Trust recognizes excellence in revitalizing the nation’s historic Main Streets. Main Street Bath, a downtown organization that runs under the umbrella of the Trust’s Main Street program, was one of five U.S. cities honored with the award Monday during the National Main Streets Conference in Baltimore. Under the four-point Main Street approach, which was implemented by the trust 30 years ago and is used in 2,000 communities in the United States, Main Street Bath has helped the city’s downtown use its shipbuilding heritage to stay relevant in the face of competition from area big-box stores and to overcome the disadvantage of a Route 1 highway overpass that diverts traffic away from the commercial district, according to a press release. The four-point approach includes organization, which includes the creation of programs such as Main Street Bath; promotion of a positive economic image; careful design and capitalization on the positive aspects of a downtown’s environment; and economic restructuring. Jennifer Geiger, director of Main Street Bath, said the win by the City of Ships marks only the fifth time that a New England community has been selected and the first for a municipality in Maine. The other New England winners were Burlington, Vt., in 1997; Milford, N.H., in 2002; Littleton, N.H., in 2003; and Boston, Mass., in 2005. In the past, Bath has been named a National Historic Trust Distinctive Destination in 2004 and the city’s Front Street was designated one of America’s “Great Streets” in 2009 by the American Planning Association. Bath, which is in Sagadahoc County on the shore of the Kennebec River, is also a recognized Preserve American Community and a Tree City USA. The other four 2012 winners are Culpeper, Va.; Jacksonville, Ill.; Valley Junction-West Des Moines, Iowa; and Washington, Mo. Winners were selected by a national jury composed of former award-winners, community development professionals and government agency representatives who are engaged in economic development and historic preservation projects. Bath City Manager William Giroux said the accolades Bath has received over the years don’t go unnoticed either inside or outside city limits. In addition to creating hometown pride, he said national recognitions over time bring in tourists and that the city has some of its most active members to thank for that.